It was about 36 hours into 2015, when we said our goodbyes to Idaho family and loaded our tired boys into the car so we could embark on a semi-snowy, post-holiday trek home through four states– four western states which are big… not like those mushed together northeastern states, where people commute through four states just to get to work every day. Our first stop was six minutes later at Dutch Brothers Coffee just outside of Boise. I’d never been there, but according to my Facebook feed, people love Dutch Brothers, and how photogenic Dutch Brothers cups are in their hands on the way to work. We were warned that the staff were aggressively nice, and would probably be enthusiastic and hell-bent on making our days great. We’re not talking kind-grandma baristas searching our faces for signs of sleep- and hug-deprivation. These were young bearded bros who walked out to the cars to take orders and in addition to being really really pumped about our coffee choices, were curious where we were off to, and where we’d been. The long line of cars represented dozens of people waiting patiently for their daily affirmation from dudes whose “sneaker games were on point,” this according to the unnamed teen in our backseat. “So true!” I thought, “It’s early and I have the whole day ahead of me! I will own it!” Also, what was I gonna be that day? Whatever it was, I better be good at it. My options at that moment were slim. I was very much a passenger, set to be in the front of the seat of the car for the next bazillion hours. 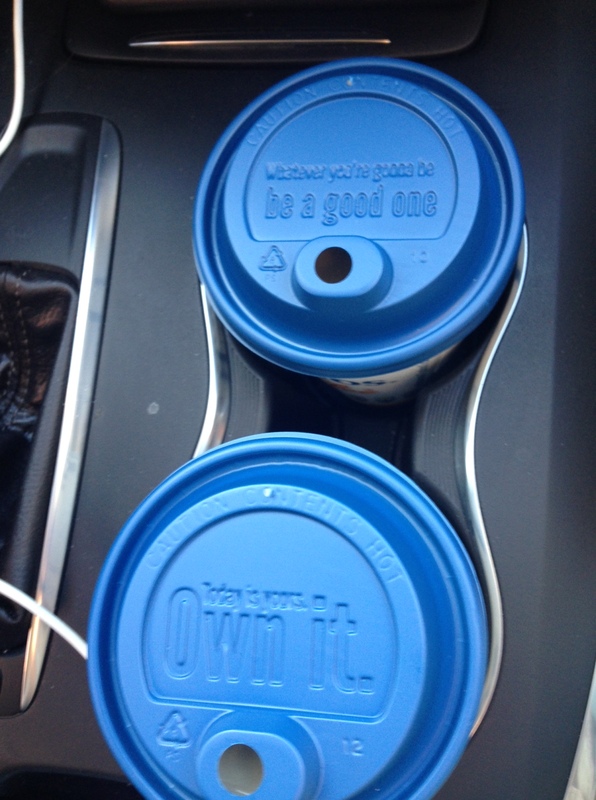 I looked at my husband, who that day was the long-haul driver, and just as the cup suggested, he was a good one. He was alert, and cheery, and totally owning the day. I was sitting there, sans steering wheel and pedals, with no official duties as passenger other than handing people tissues, refereeing the backseat shenanigans, and making sure that everybody got out of the car at the gas station to go to the bathroom. I made conversation, but not too much conversation so as to be a nuisance. I may have dozed off once. 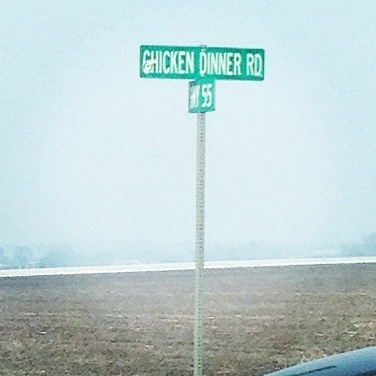 I took pictures of street names like Chicken Dinner Road and Potato Road, which sadly were hundreds of miles and two states apart from each other because, if they were together, that would be a highly desirable-to-me neighborhood. Because it takes me forever to drink a regular cup of coffee, I had my cup through Idaho, Oregon and all the way to Winnemucca, Nevada. By the time I replaced it with a less-motivational Taco Time Coke, (so caffeinated, and nowhere to go!) I’d already been staring at the bro’d-out version of an (albeit, disputed) Abraham Lincoln quote, and then stared out into the desert, then back again, all the time wondering what exactly I was, and whether or not I was a good one. I’d thought about this exact thing plenty as of late, but this time I had hours at my disposal, and zero cell reception. Don’t worry, I won’t turn this into a tome of self-discovery that would be readable only to someone on a bazillion-hour road trip, with no cell service, and who doesn’t get sick while reading in the car, and who is also my mother. I did however, for a few minutes, think maybe I could solve here, what I couldn’t that day staring out into the desert. What am I, really? Like all parents humans, I’m a lot of things all at the same time. Sure, my list doesn’t currently include a job, but even though I’ve spent the last couple of years trying to be a good stay-at-home mom, whatever that looks like, while rehabbing my brain after that bizarre brain virus, I’ve still kind of thought of myself as a working mom. I just happen to be a working mom who doesn’t have a job. I mess up all the time; it’s true, ask my kids. I’m also not really leaning in or leaning out, and I don’t think that the debate of how women in particular should be juggling their lives and families, is one where a single viewpoint is ever going to emerge as universally correct. All of our situations are fluid, and confusing, and unique, and sometimes really, really hard. Sure, this is a dated discussion, but it’s not dated if you’re in the middle of it. And I know I can’t be the only person – man or woman, parent or non-parent – to repeatedly wonder if I’m doing the right thing, how long I should do it, and what I should do tomorrow. Happy New Year! Find me on Instagram, @colleenweems. how to bore yourself into having the best summer you will never forget. Gosh I’ve missed your writing Colleen! Love this! 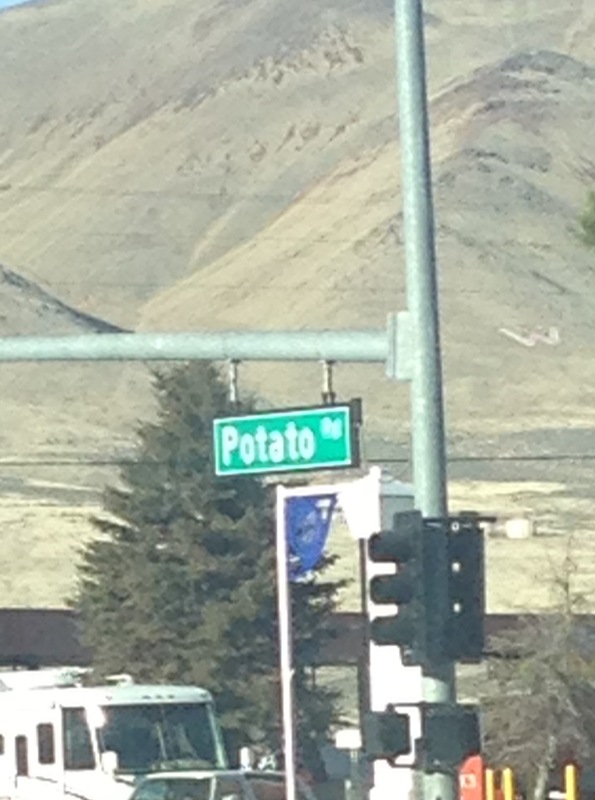 Will you be living in ChickenDinnerPotatoRd. city when you design those lids? Lovely writing. hahaha, I like the way you think Alison! Thank you! I love that we have noticing unusual street signs in common… Great column! Your best one yet, Colleen! Don’t worry about trying to “own” a day. I’ve been trying for 88 years, and still haven’t managed it—so I don’t want to hear about it again! You should take long car rides without cell service more often! Thank you for powerful reminders not to shrink back from who we be.